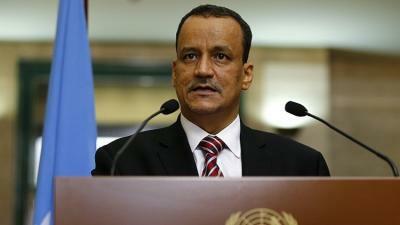 Almotamar.net - The UN special envoy to Yemen Ismail Ould Cheikh Ahmed arrived on Sunday in Sana’a for a two-day visit. He pointed out that he will seek, during the visit, thoughts that maybe translated into tangible plans, noting that he will work to activate a new ceasefire and described the recent cease-fire as “fragile”. “As you know we are seeking to activate a ceasefire which we worked on two or three days ago and it is undoubtedly fragile and there are many risks but we will work to achieve a ceasefire to allow entry of humanitarian assistance and prepare atmospheres for a political solution,” the UN official said.